When I first got this assignment, I texted my husband—I was curious to see what he would come up with as my favorite healthy foods. His response: “Mexican, pizza and cheese.” Thanks, honey. I knew I could count on you for a little help. 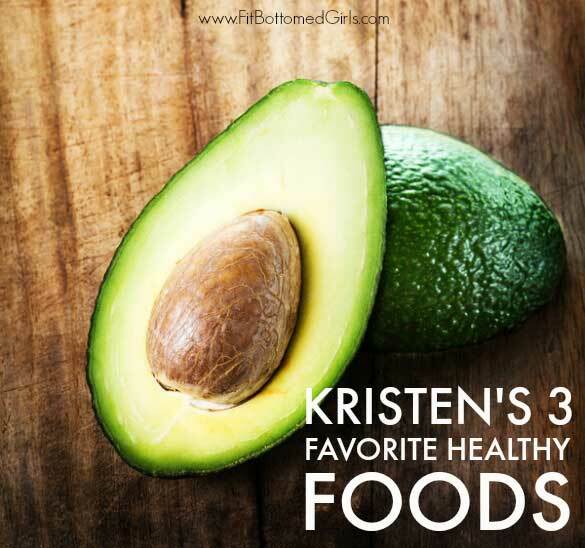 It’s not that it’s hard for me to find three healthy foods that I love—far from it! Like Jenn, I dig my fruits and veggies, and I’ve been known to show some love to the legumes. It was hard to narrow things down, although, and I must admit that Jenn snagging eggs and nut butter as her faves definitely narrowed my choices. Good lord, do I love peanut butter. And almond butter. And oh, have you tried cashew butter? Do yourself a favor and don’t even try it. Don’t do it. A smidge is healthful. The amount you’ll want to lick off a spoon? Less so. With no further nut-butter lust, let’s get to it! 1. Avocado. In salads and on toast, avocado, I love you the most. Well, at least enough to put you in my top three. It’s just so versatile—I mean, what can’t you put it in? It’s a perfect accoutrement to some scrambled eggs and salsa, but equally delicious with spinach, strawberries and almonds. Throw it in a smoothie to make things extra creamy, or mash it on a sandwich in place of mayo. You just can’t go wrong, which is great, because I do enjoy being right. 2. Chickpeas. You know how I mentioned the spinach/strawberry/avocado mix above? Well, throw some chickpeas on that baby, and let’s call it a real party! These are such a tasty and simple source of protein that I don’t know where I’d be without them. Truthfully, I mostly eat them on salads, but I’ve also roasted them for a super healthful snack, added them to soups, sauteed them and mixed ’em up with veggies…and I’m sure there have been lots of other uses throughout the years. Oh, wait, that’s right. Hummus. ‘Nuff said. 3. Red bell peppers. They’re sweet, crisp, juicy, and—like my other choices—awesome in a wide variety of dishes. I’ve talked about roasting them before, but I often lightly sauté them before serving them in veggie fajitas or quesadillas, or mixed up with black beans and whatever other veggies I have on hand for a quick meal. And, you know how I mentioned hummus above? There’s pretty much nothing better than a fresh, raw red pepper dipped in hummus. Bonus—peppers help with iron absorption, so pairing them with my beloved chickpeas means I get more iron than I would from the chickpeas alone. Winner, winner, chickpea-and-peppers dinner! Avocados are my fav and can eat them everyday. I add them in salads or alone as a snack. Thanks for giving me the idea to put some in a smoothie. Avocado is my ever and never end fruit!! I like not only salad or milk shake but also my fav facemask aslo! !…..happy to read your article.